This Historic Creole Cottage was built in the 1840s and possesses all the unique charm of old New Orleans. Let’s visualize your arrival curbside to a brick-paved wooden cottage surrounded by wrought-iron fencing. It is adorned with large shuttered windows, red doors and a breezy porch. The scene is great for an outdoor snowball/po-boy picnic or cool cocktail prior to walking to the nearby art/antiques boutiques only two blocks away at Magazine Street. Imagine the smell of barbecue from the smokehouse only a block away and crepe myrtle flower petals blowing in the breeze( a Garden District classic). 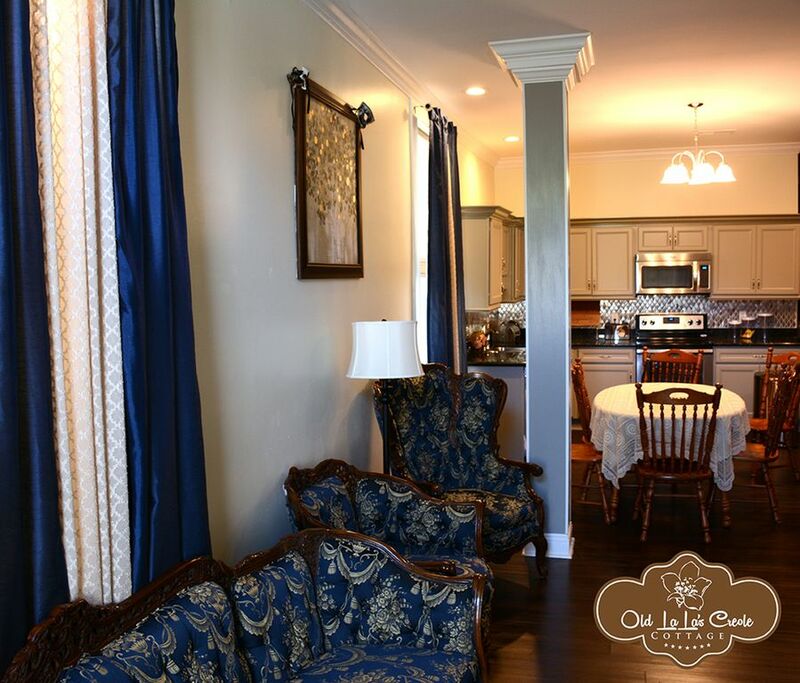 Let’s enter the red door and experience a charming French provincial living space with modern amenities. The black granite countertop has stainless steel backsplash and is equipped with toaster, coffee maker, pastry/bagels and microwave. There is a seated dining area for 6. The table is covered with place settings and a centerpiece. The fridge is stocked with water and wine per your order. You feel at home. Now you can head upstairs to the loft or walk through the kitchen into a hallway. Upstairs there are 3 beds (2 twins and 1 queen) in a 19 ft by 12 ft area. There is a television within an armoire and a closet. 2 seating areas are available as well. Upstairs is carpeted with a window for natural lighting. If you remain downstairs there is a short hallway which leads pass a full immaculate bathroom and another private bedroom with a full bed and bench seating and finally ending in the office pallor. This multi-purpose office pallor has a roll top desk, a television, a laundry closet and large couch to lounge on. This is a great scene for kids to watch television as they wait to attend the zoo, aquarium or a parade which are minutes away. After walking through the office pallor, you will want to lounge but the master suite awaits as you sashay through. The master suite has a bathroom and separate study area that can double as an additional room by closing the pocket doors. The bedroom has a queen bed and the study has the television with a 2 daybed trundle sets that sleep 2 each. There is also a double mirrored closeted hallway leading to master bathroom. If requested it is ok to the keep walking to additional space through the back master suite which loops into a connected mirror image open space with extra bathroom, extra television den with sofa sleeper, extra kitchen space, extra dining space, extra loft with 4 more twin beds and extra private room. Ask for unrestricted access to this space to expand living quarters from a 1500 sf to total 3000 sf. All furniture is elegant and antique. All bedding is cleaned, fresh and 400+ thread-count. There is central air, cable TV and wi-fi and security locks at the gates. You will enjoy this home so much, that you may not leave and enjoy a night on the town at the casino, Frenchmen Wharf’s live jazz and bourbon street (all 5 minutes away). Please come and enjoy our brand of hospitality and experience world renown entertainment, restaurant cuisine, tours, architecture and music. Lassiez Bons Temps Rouler! Airport and convention transport available per request. Catered meals available per request. Additional space available per request to sleep 6 more individuals (by doubling the space) at an additional cost. Contact owner for special requests. We are local couple who grew up in the area and met as children. We were in graduate school during the Hurricane Katrina and engaged. We had a Katrina wedding in another state and returned home in 2006. It has been a great experience to live and grow in New Orleans and we are raising our family here. After traveling various places in the world we have heard and experienced the uniqueness of our own city. We would like to share that experience with you. This property exudes what we feel "real" New Orleans charm is. We both grew up in shotgun-styled homes and we decided to put a modern twist on this one. We allow you to rent per group size. We ensure privacy and keyless entry. We are very flexible to ensure your stay is enjoyable. The home itself is unique. How many modern homes can boast true new Orleans flavor from the 1800s with such beauty and elegance and antiquity. We aren't done either. Keep visiting because we plan to grow greater every year. Merci Beaucoup. Airport and convention transportation services available per request and availability. Professionally catered meals available per request and availability. Sleeps small and sleeps big groups! Contact owner for special requests. The party starts here! Concerts, sporting events, festivals, and various tours are within walking distance from Low Garden District area where uptown meets convention center & the warehouse district. 2 separate dining areas with full access. Executive Shuttle Transportation-Book early and save time and money. Up to 14 passengers. Ask ask about event pricing and special weekend deals. Additional space available per request to sleep 6 more individuals at additional cost. Contact owner for special requests. This place was perfect for the large group we had. There was plenty of space, beds, and amenities for everyone. The hosts were amazing and attentive. I would not hesitate to stay again. Thanks for the great experience! Great home with plenty of space! Great house, perfect for our family of 9. Good location. Great to have bagel and cream cheese when we got there. Where old Friends come together! I can not say enough about this house and all of its accommodations! The location was perfect for our bachelor party (close enough to enjoy all of NOLA, but far enough away from Bourbon Street to feel like a retreat). We had 11 grown men on our stay and there was plenty of room, beds and bathrooms for us all. We will definitely be back! Thank you Mia!!!! A great place to stay in NOLA with amazing owners! The place was clean and beautiful and perfect for our bachelorette party. The owners were super accommodating and helpful and easy to work with. We didn’t spend a lot of time in the neighborhood, but it was easy to get to everywhere we wanted to go from here. Would definitely book again for another group! Great time, plenty of space! I came with a large group of ladies for a convention. We all had our own bed and plenty of space. The owners were incredibly nice and helpful! Thank you! This home is a gorgeous newly renovated creole cottage with all the amenities of a modern New Orleans Home. The home is 2 blocks from Magazine Street antiques and boutiques and 2 miles from the French Quarters. 1 block from the Irish Channel. The home is along the Mardi Gras and St. Patricks' parade route. The Morial Convention center, Riverwalk outlet mall, Aquarium and Algiers ferry are all a short walk away or 2 minute ride. The street car/trolley can be found within a mile away. The Zoo is also nearby with a seasonal lazy river and cool zoo exhibit. This is a safe home in the heart of New Orleans. For parties under 12 ask about renting the additional space (which doubles the entertaining and sleeping areas). Parties over 12 are automatically charged a fee per night per guest for the additional space. Initial booking deposit is nonrefundable within 60 days of checkin date (possible 50% refund for off peak seasons). The Damage Deposit (used for rapid repairs to avoid interrupting future guests' stay) and Property Protection Insurance (used for larger repairs) are charge separately but are equally important.